While we celebrate Taco Tuesday each week, the recipe doesn’t change much and since I promised 31 recipes, I thought I’d consider it’s use of tortilla’s in the recipe a loophole and bit and share with you this easy dinner or delicious snack. 1. Preheat oven 425 degrees. 2. Place a tortilla on the baking sheet. 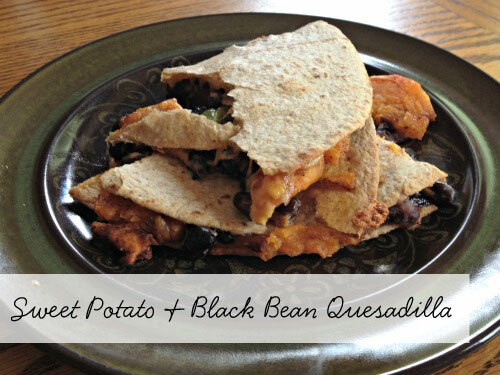 Scatter the sweet potato chunks on the tortilla, and then fill the spaces between those sweet potato chunks with the black beans. Sprinkle the green onions and cheese. Top with the other piece of tortilla and press it gently. Bake for 6- 10 minutes, or until the cheese is melted and the top piece tortilla is golden brown. Cut into wedges & serve. Makes 2 quesadillas, serves 4. This sounds amazing! I will have to try it with gluten free tortillas instead! What a creative way to create a quesadilla. I'm sure my husband would love these! I was surprised at how much my husband enjoyed them. He's usually not a fan of anything with sweet potato in it but he DEVOURED these and asked for them again soon!